Topics: Select A Section, Dining & Entertainment, Holiday Happenings, Dining & Entertainment, & Ivending Wonka Promotion. 119 users visit the site each day, each viewing 1.90 pages. my.yahoo.com Sign in to Yahoo! 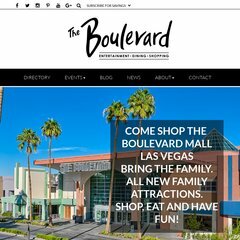 Boulevardmall.com's IP address is 204.12.127.38. It is hosted by Vshift (Delaware, Newark,) using nginx web server. It has 2 DNS records, ns1.generalgrowth.com, & ns2.generalgrowth.com. PING (204.12.127.38) 56(84) bytes of data. The server is faster than 74% of measured websites, at 2703 milliseconds. Also a time of 38.9 ms, is recorded in a ping test.